❄ Freezes well. May separate or become watery when thawed; mix to combine. Okay, you are going to read this recipe and think one of two things: Either this lady is totally insane, or this lady is the most clever person to walk the kitchen floor! Wash the squash and place the whole squash into the slow cooker. (This is not a joke!) If you’d like, lightly swipe olive oil on the bottom of the vessel to help prevent sticking; this is optional and I have never found the squash to stick. You could also add 1/2 cup of water to the slow cooker if desired instead of the oil. Remove the cooked squash from the slow cooker and allow to cool. 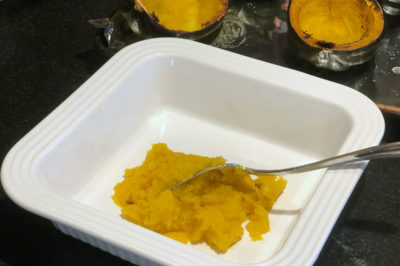 Once cooled, cut the squash in half and remove the seeds. Scoop the flesh out of the shell and into a bowl. 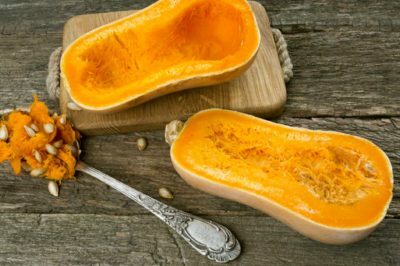 Place the squash in a blender or food processor and process to a texture that is appropriate for your baby. Add water, formula, or breast milk as desired to create a thin puree. Store in the refrigerator for up to 3 days for babies and up to 6 months in the freezer. 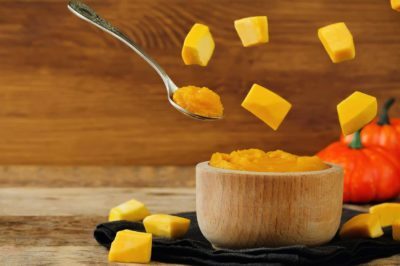 If you’d like to get a bit adventurous, make a curried squash soup with the puree by adding broth to thin to your desired consistency and 1 teaspoon of curry powder for starters. Stir and taste, then season as needed to achieve a perfect-for-you curry soup. Don’t forget the dollop of yogurt or sour cream to finish.